As another mass market quality brand says, "food should taste good." As a marketer of locally grown foods for 9 years, I found that the assumptions that existed in the campaign planner's minds prior to launch (people want SUSTAINABLE local food) were quickly dispelled by some basic market research. The challenge in planning a marketing campaign of any kind is that you think your beliefs are generalizable to the broader community. But more often than not, your beliefs and those of your colleagues and associates are like the skin on an apple. Apparently everywhere, but dwarfed by the true majority. People want food to taste good first. They they want it to be from their community, and to support community economic development and self reliance. Organic eventually showed up on our surveys in 5th place. This study shows more about the myopia of Chipotle grill than anything else. You could turn this on its head and say Chipotle is succeeding with quality foods--if you consider quality=tasty food. Busy customers may not take the time to evaluate Chipotle's green practices, but they do know they can get an affordable good lunch. Although Chipotle's customers may overlook the company's commitment to sustainable food, Chipotle's growth still demonstrates that fast food can be achieved sustainably. And that's a good thing. I think this is something the industry, rather than consumers, takes note of. I gotta argue that the two points work together. Anyone that has tried grass fed beef along side your mega beef slaughter house type is going to taste the difference. 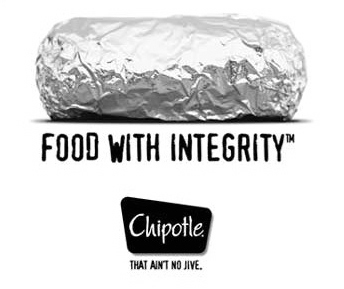 I would argue that Chipotle tastes as good as it does BECAUSE it is "food with integrity". Quality ingredients mean a better eating experience. And I mean flavor, and digestion. I beg to disagree. It matters to me that they use good ingredients, and that's why it tastes good. This is like the chicken and egg issue: there's no way to separate both things; and I hope Chipotle is not using this "data" as an excuse to slack. That would drive me away as I've been driven away from countless places. People that say organic doesn't matter to the consumer may be missing the point. Organic costs more and not everyone can afford it. Perhaps that's the reason their "surveys" turn out to put this as a last factor. Most consumers have been brainwashed to the extreme into not minding what goes on their food as it's being produced. Good, nutritious, sustainable and humane food sources DO MATTER. Ever since we saw that animated video with Willie Nelson singing Cold Play's "The Scientist,"we've been Googling like crazy to try to separate the facts from the feel-good (and extremely effective) marketing. Even before the video came out, critics have questioned whether Chipotle's ingredients are really healthier and more sustainably-produced as claimed. Check out Amanda Radke's blog post over at Beef Central for a taste of sour grapes. Radke's never met a feedlot she didn't like and the comments that she allows to appear below her post (many pro-Chipotle comments seemed to disappear soon after they were posted) lay out some of the allegations that the burrito makers are all hat, no cattle.